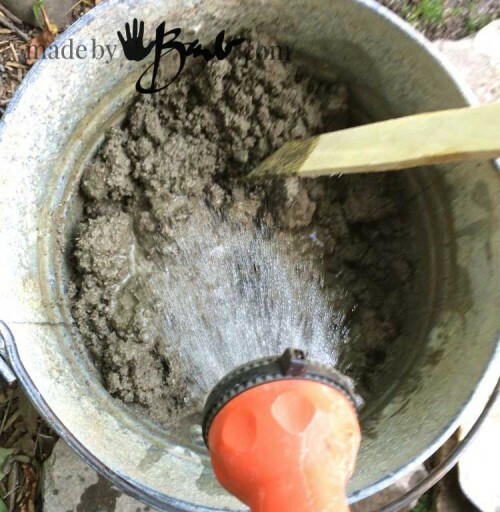 Gee, most people think of beaches when summer hits; I think of what I can do with concrete. 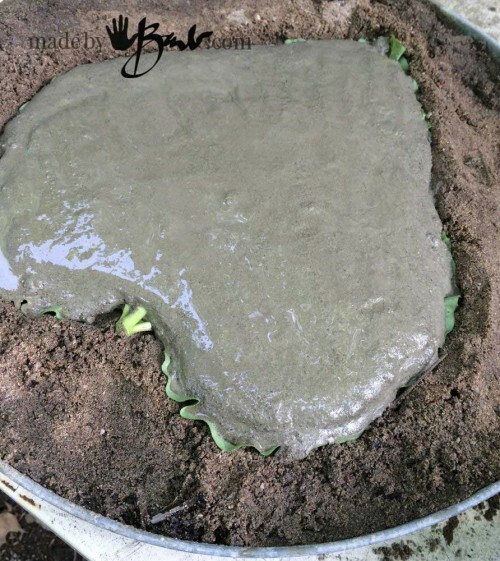 Make some Easy Concrete Stepping Stones! Silly, maybe, but I like the permanence of these projects and the rather inexpensive supplies. It’s also time to admire the wonders of nature and make use of the gardens bounty; my Rhubarb plant! 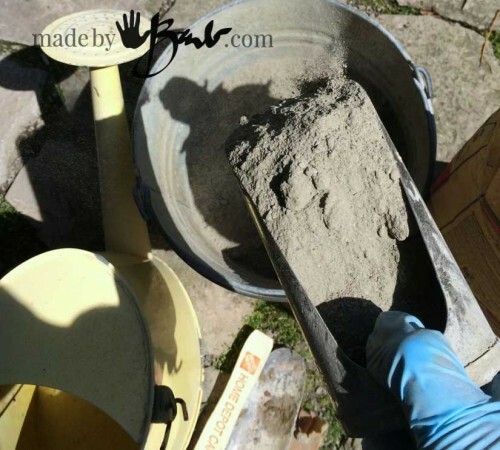 I am sure you realized that you need concrete, but it’s even easier as you don’t need to mix separate components. 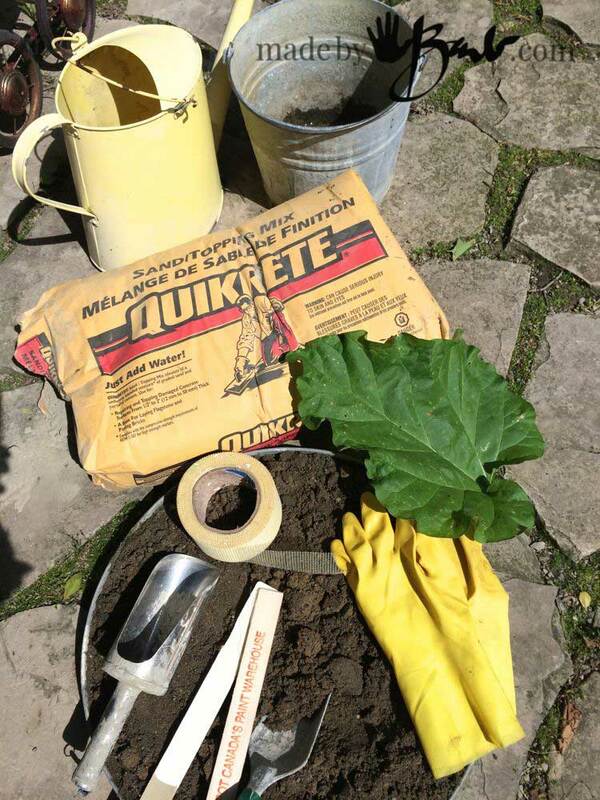 This ready-made “Quikrete” mix is perfect for the job, and it comes in a size that I can lift! It’s available at most home improvement stores like Home Depot And Lowes. 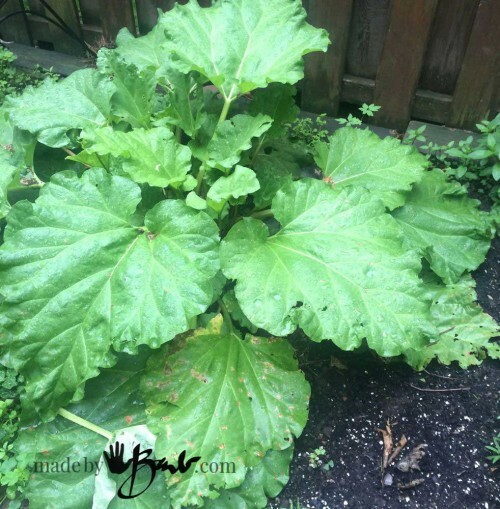 If you don’t have access to any Rhubarb, you can also successfully use the large leaves from the thistle weed. They are in huge abundance at the side of the roads. They are just a bit fuzzier in final texture. I’ve used them when I didn’t want to sacrifice too much of my plant. Start by getting your “form” ready. 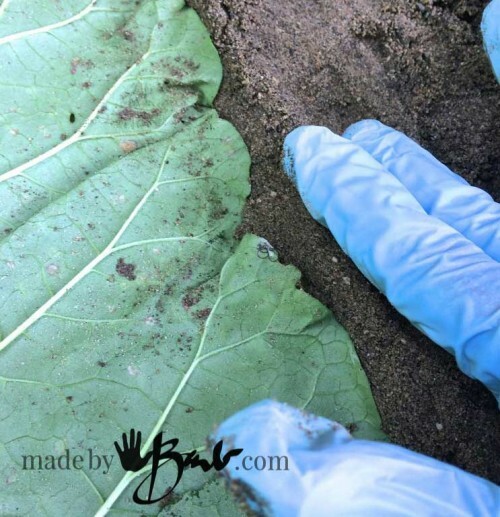 To get the natural curvature of the leaf form the damp sand under the leaf. Be careful don’t break the leaf. Build up the sides to have a rounded edge. At this point you can use a mound of sand if you want to make a bowl. To have a nice smooth curve at the edge, I form the sand around the shape. Don’t get sand on the leaf. The veins should be facing up. Wet sand is quite easy to form. More fussing now equals great results later. 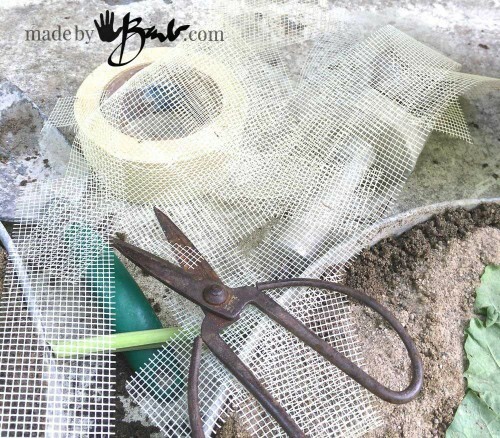 I also get the drywall mesh ready so that I have it at hand when I have “concretey” hands. I cut a bunch of strips that are about the length and width of the leaf. 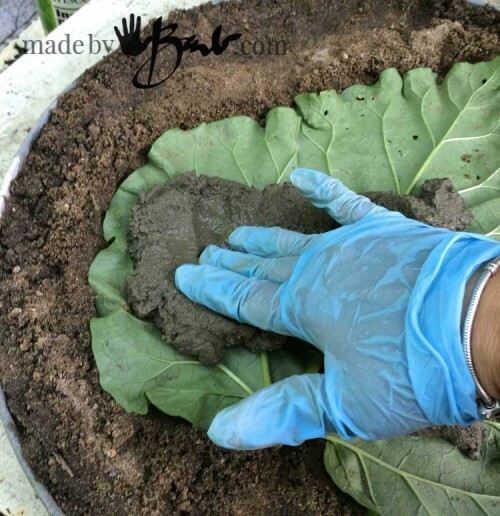 I add enough Quikcrete that looks like it would cover the leaf, ½ bucket or less. You’ll get the feel after doing one. 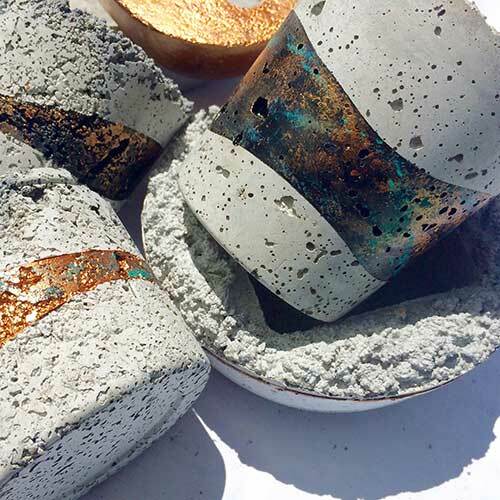 This concrete is meant to be used in rather thin applications. I have some stones that are barely 1” thick and many years old. Add water slowly, mixing deep into the bottom. At this point you probably would like a labourer, depending how many you are making. It is usually ready when it doesn’t have standing water on top, and holds shape a bit when stirring. It should have some slump (meaning that it will flatten itself by flowing outward) but not be too wet as to leak much water. Over watered concrete is weaker. 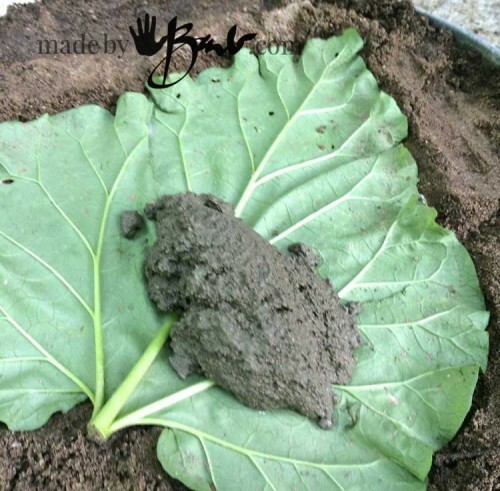 Squish a bit in your hand and it should not crumble, hold a bit of shape and not be runny. 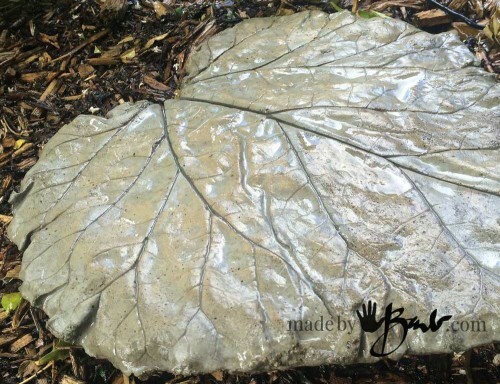 It’s now just a matter of glopping the concrete onto the leaf. No rocket science here! However, the trick to a very detailed imprint is the “slapping”(vibrating). The pros have agitators that vibrate the cement to get rid of voids and air bubbles. You have your hand! Slap, slap, slap… It also makes the water come to the top, which is a good thing, I’ve been told. 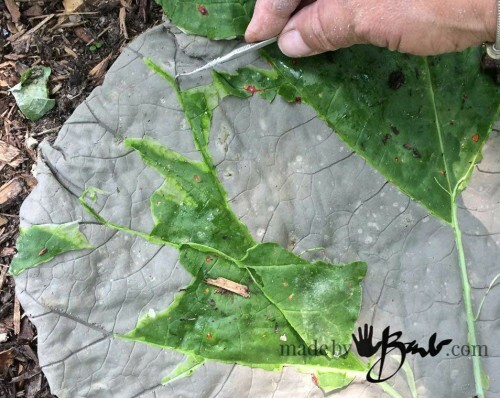 Stay just within the edge of the leaf and keep it on the thin side as you will be adding another layer. Perhaps about ½” or more. Once covered, criss-cross the mesh paying attention to getting it over the main stem area. Since the main stem (artery) is thick, it is also the weak point since it will leave the biggest void. It’s even best to mound up extra thickness there. Now just add your other layer, covering the mesh enough and smoothing out. Note the sandy texture on this one. I should have slapped (vibrated) it more! I use some dental tools to aid in the removal of the veins, but they will eventually decay away anyways. 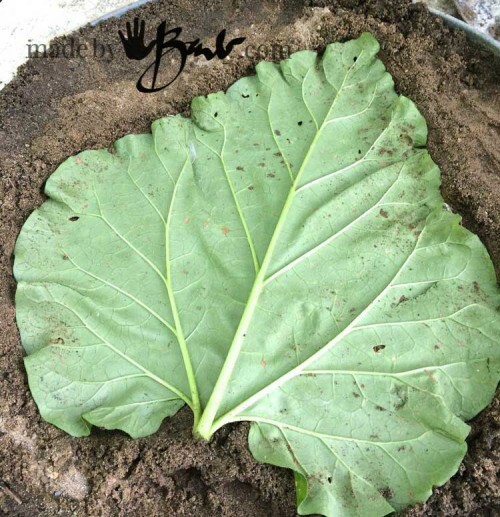 Barb, your tutorial on making a concrete stepping stone using a rhubarb leaf is very well done. 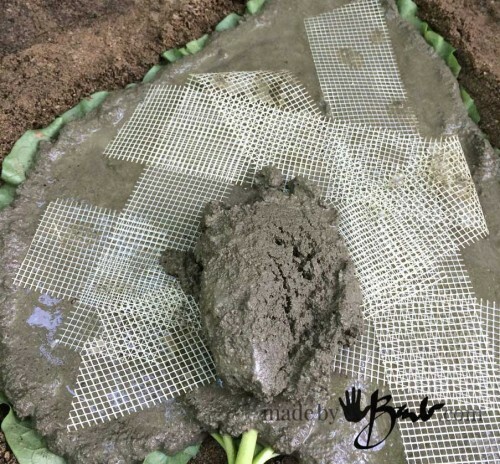 We’ve made several bird baths using a similar method but found that the leaf is easier to remove if you spray it with cooking oil spray before applying the concrete. 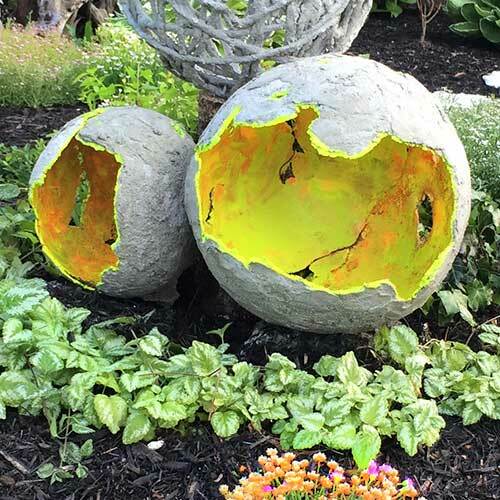 We also used the shredded fiberglass fibers available in the construction area of Lowe’s or Home Depot. These are mixed with the wet concrete so you eliminate the step of adding the strips of drywall mesh. If any of the little fiberglass hairs stick up after the concrete has hardened, they are easily removed with a propane torch or BBQ lighter. Thanks for all your wonderful garden projects. Thanks! I have used those fibers in many of my concrete projects. I had used the spray as well, but i don’t have any problem getting the concrete off. I also would rather not have any greasiness to the concrete in case of any finishing. Even the many molds I have made work well without the release agents. I think my concrete journey started with those stones! ‘And it’s progressed so much from there. 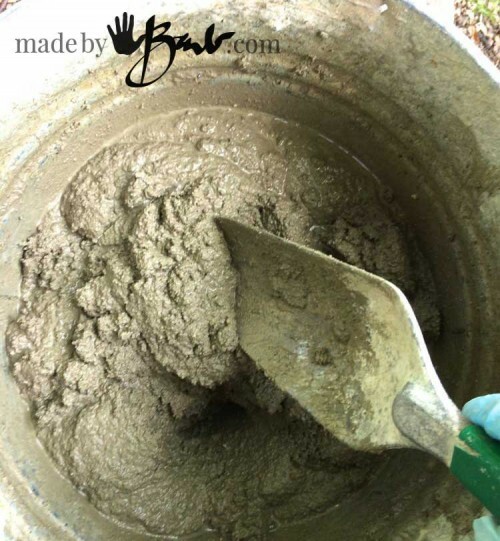 You prob would enjoy this post if you are new to concrete. I much prefer the quickness of the fats setting concrete’s! 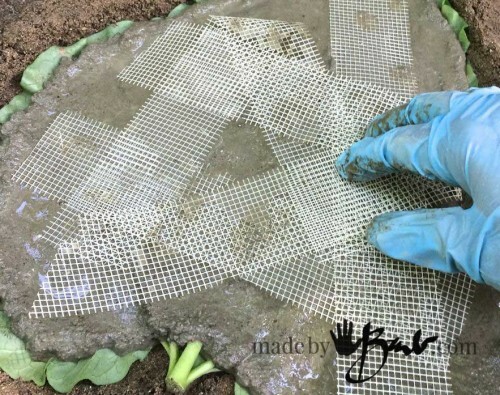 When making a mold for leaf stepping stones (I have quite a few castor bean plants with leaves just screaming to be made into stepping stones) do I use the same process with the silicone and corn starch? Would I press the silicon into the leaf? It seems easy enough, with your tutorials, I just want to make sure. Thank you!!! 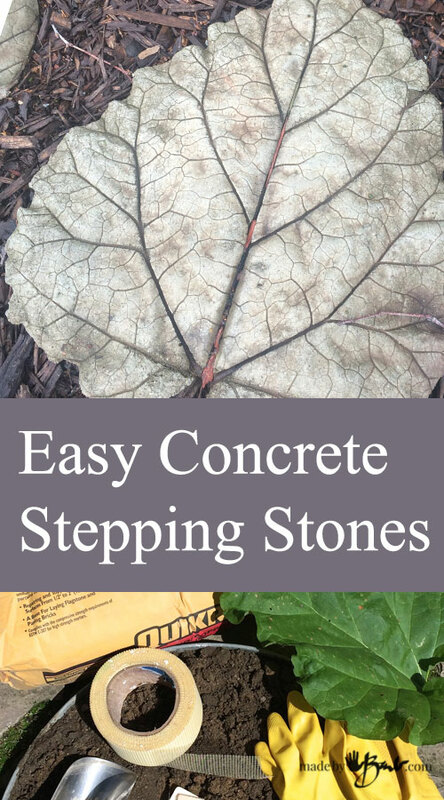 Yes, it may be easier to just use the leaves for a stone each time. But if you want to make a mold you can. It may be quite flat depending on how you support the leaf. I did it here . Just make sure the mix is worked well until it does not stick and then work quickly to get it on. I like to give the stepping stones some roundness at the edges. Maybe some damp sand will allow some support… Happy making! Let me know how it goes! Hi Barb, I plan on using this sand topping mix for a small project. If I wanted to mix a small batch of this what would the volume of quikcrete to water be? Thanks for the help!